There have been calls by energy experts for the reduction of gas prices, and Mr. Awotwi reckons those calls are germane. “It is true that the terminal gas pricing in the country is quite high. I think PURC has a price of US$7-30 a million btu, and that translates to about US$40 a barrel of oil. When you look at other countries, for instance the US, gas price is less than US$3. People ask why it is so expensive, and among the reasons is that it’s tied to infrastructure that was built for the first time; but it is true that gas is relatively more expensive, and it may make a difference when prices are reduced. “I think there is a challenge between reducing prices and recovering the cost of initial investment, but it could make a difference,” he told B&FT on the margins of the first investiture and induction ceremony of the Chartered Institute of Supply Chain Management (CISCM) Ghana, in Accra on Thursday. Reports have already indicated that the tariff paid on gas supply for both domestic and industrial use may be going up from March this year, 2019. This is the result of government’s decision to restrict gas supply from the Jubilee Field due to the coming onstream of gas from the ENI Field. The restriction follows government’s agreement with ENI to consume the gas to be produced from the Sankofa Field. The Sankofa Gas produced by ENI is expected to come onstream from March 2019 to produce associated gas for the Ghana Gas Company to power the Karpowership plant. Ghana has made significant savings and met environmental benchmarks due to the gas sector. 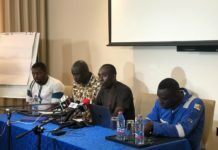 However, it’s faced with structural non-payment issues due to inability to pay for gas supplied by exploration and production companies to the Ghana National Petroleum Company through the Ghana National Gas Company for use by the Volta River Authority and other Independent Power Producers. In Ghana about 60 percent of power comes from thermal sources, statistics show. At the CISCM event, he urged supply chain management practitioners to conduct research into integrated supply chains to facilitate policy initiatives of businesses and government. According to Mr. Awotwi, research and case-studies in the energy, oil and gas sectors will be good starting points, given the vertical integration and upstream-downstream activities in related industries. He explained: “With restructuring of the energy sector, there are many players in the generation of energy. There are also the distribution companies ECG/NEDCo as well as the National monopoly of the transmission sector. For Mr. Awotwi, it is not by accident that most of the best-performing companies have established supply chain management systems in the form of business units, directorates, divisions or departments to optimise various interrelated supply chain functions – spanning planning, accounting, finance, sourcing/procurement among others – to add value and recognise the sovereignty of third parties and internal customers. Leadership plays a crucial role in achieving this objective, he said, maintaining that companies need to establish leadership that initiates action and works with subordinates through effective communication to realise it. Furthermore, he added, there has to be a leadership that motivates through economic and non-economic rewards to get the work done. He also noted that the manner in which a company is able to put into practice benefits and minimise the challenges will facilitate the reaping of long-term rewards. Supply chain business units when properly resourced can bring about cost-efficiency, increase in revenue, quality control and gaining competitive edge, Mr. Awotwi noted. On his part, the president of CISCM Ghana, Richard Okrah, stated that in the short-term the institute is targetting the energy sector – where with the sector reform policy there are several players in the generation and distribution area. The investiture ceremony also saw seven distinguished professionals been inducted as Fellows by CISCM – comprising Prof. Aba Bentil-Andam; Prof. Esther Sakyi-Dawson; Dr. Joseph Siaw-Agyapong; Dr. Theresa Oppong-Beeko; Kweku Andoh Awotwi; Ing. Emmanuel T.Antwi Darkwa; and Joe Ghartey.